How Can We Develop Creative Players? Every professional football team wants to have creative players. In today’s world of football, there’s a trend currently for creative little no.10’s. Even the Premier League has followed this evolving trend and style, with Club’s taking note of the success of Barcelona and the Spanish national team between 2008-2012. English clubs have imported no.10’s including David Silva, Juan Mata, Mezut Ozil, Santi Cazorla, Coutinho and Christian Eriksen, even if they aren’t always played in that specific role. Those six have all come to England in recent years as the Premier League evolves. In England we don’t typically produce that type of player. But why not? Scoring a goal is the hardest thing to do in football, so why aren’t we producing more of the type of player who can unlock a defence? We have to start at grassroots football. Kids up and down the country are being shouted at when they’ve got the ball at their feet. Coaches and parents telling them to pass, who to pass to, to run with the ball, to cross, etc etc. And we wonder why we create robots who can’t cope at World Cups against teams that close us down quickly. We have to allow children playing the game to think for themselves, become adaptable to different situations and able to find solutions on the pitch. How do we do that? Can we coach creativity? I don’t think creativity is something you can coach, as such. I’d describe it as something we can help children develop by setting up the right environment. Maybe it depends on your coaching philosophy though because that’s actually partly how I’d describe the role of a coach. Set up games where children are forced to figure out ways to solve a problem. Games that reflect the real game and situations they may be faced with in a match. Games where they’ll have to make decisions. Create an environment where kids aren’t scared to try something new, to try a trick/skill or to try that ball through a tight gap that might send a team-mate through on goal. If they’re afraid of taking risks and trying things when they’re young, it’s unlikely they’ll grow out of that. Ask why they have this fear? Do parents moan at them if they try something and it doesn’t come off? Does the Coach criticise them or tell them not to try it again? I often hear Coaches telling kids to “keep it simple”. They could potentially be stifling great creative talents by making them keep it simple and not do extraordinary things they could be capable of. As a Coach, you’ll need to get the parents of your players to buy into what you’re doing. Even if they’re not an influence during the games, they can be an influence on the player for the rest of the week. So explain and set out to your group of parents what you’ll be doing, how you’re going to achieve it and how they can help you. Kids are the most creative and imaginative people in the world. They just have it battered out of them by the time they reach adulthood from people telling them they can’t do this and they can’t do that. Football offers a chance to retain some of that imagination that children possess. Or at least it should be able to in the right environment. Just let kids play the game and you’ll be surprised by how creative they can be. Probably straight away, but then especially over time as a result of practising being able to think, problem-solve and make decisions for themselves. Praise players for having courage to try things even when they don’t come off. Be positive as a Coach to try and ensure your players are positive. Allow kids of a young age to dribble and try risky or creative things anywhere on the pitch. Don’t tell them they can’t do it the first time they lose the ball and you concede a goal from it. Who cares if you concede a goal in an u7 match? You’re developing players for when they get to 16/18, not for the sake of winning an u7 match that nobody will remember in 10 years. It’s an “old-school” view that players shouldn’t do any tricks or anything risky in their own half. Why not? Has this stance helped us develop players capable of winning a World Cup in the last 50-odd years? With u7-u8 mini-soccer now being a 5v5 format, there are constantly 1v1 and 1v2 opportunities for kids all over the pitch. Let them try to solve those problems without anyone trying to tell them what to do. They’ll learn as they get older to only risk the ball if there’s cover behind them. This quote is as relevant in football as it is in life. Kids will make mistakes. Adults make mistakes too. But don’t expect the same sort of decision-making from kids as you would from adults. We learn from mistakes so be positive about it. You can always speak with the player later. Ask them what they could have done differently, what else they might have chosen to do instead or how they could tweak what they did to ensure it’d work next time. But just let them play. As said above, they’ll probably surprise you with what they’re capable of and what they come up with if they’re left to it. Don’t stifle their natural instinctive imagination. And in training, have games so they can develop and channel that imagination into football creativity but again, don’t instruct them on what they have to do. 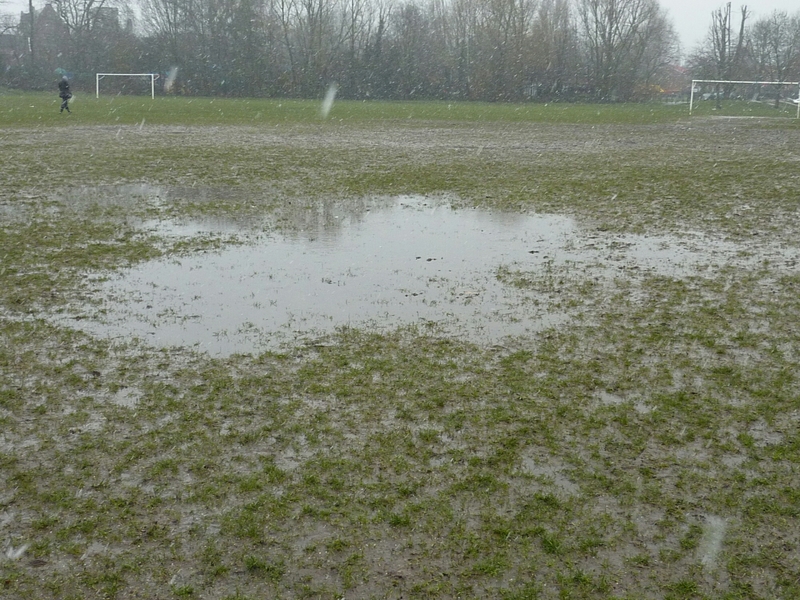 This weekend saw a complete washout of grassroots football in Grimsby and Cleethorpes. Heavy rain in the last week has resulted in unplayable, heavily waterlogged pitches and all of the region’s mini-soccer games scheduled to be played today were postponed. Football being called off is a sign that winter has arrived. We are still in November and there is undoubtedly worse weather still to come during the next few months. After the prolonged interruptions to the grassroots game in the early part of 2014, where we went the best part of two months without playing a game due to unfit pitches, I wouldn’t bet against a similar scenario this season. 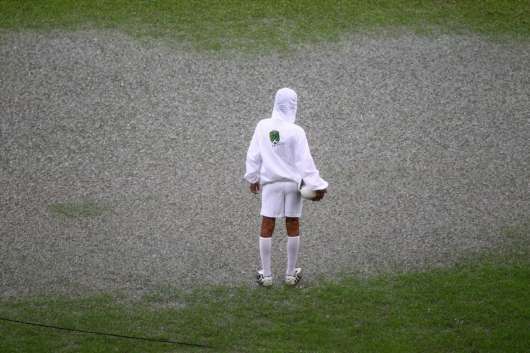 So is it time that the Football Association review the grassroots football calendar? Well, it’s a categorical YES from me. I’ve questioned before why the football season in the UK runs through the winter, when our climate dictates that many games are lost due to the weather. I can understand that the FA would want to keep it aligned to the professional game. But grassroots clubs run by volunteers, with pitches on public grounds, don’t have the money to invest in ground staff and pitch/drainage facilities to ensure games can still be played safely. Here in North East Lincolnshire, Clubs in the Gradely Sports Junior Football League play games from September until the end of April. That’s a 7-month season when you take out a break for Christmas. Last year, a mixture of waterlogged pitches and frozen pitches meant the Christmas break extended to mid February, when pitches were suitable/safe and games finally started to be played again. Would it not make more sense to have the season run from March to October instead of the current set-up? During this period we’d see much less matches postponed because of the weather and opportunities for young players to learn and develop whilst playing would be increased slightly. This isn’t an argument to say that kids need perfect surfaces to play on. Kids in less developed countries than ours have less quality facilities than us. Whilst I think we do need to improve grassroots facilities in this country at grassroots level, we could point to “beach football” in Brazil and “street football” around the world to suggest that kids don’t always need to play on a carpet-like bit of grass to be able to develop. 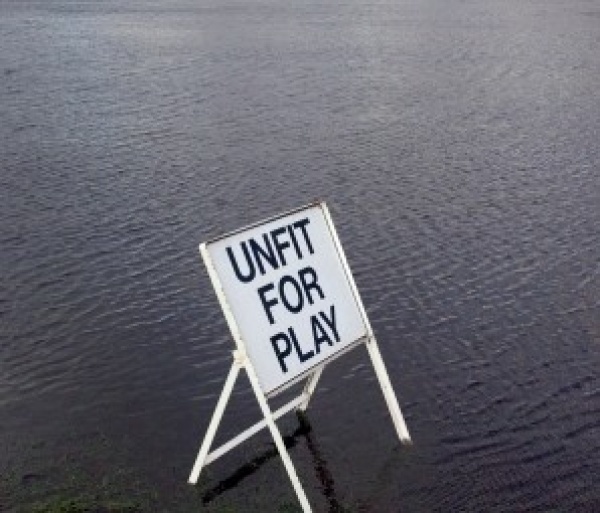 But when the UK weather claims so many unsafe and unplayable pitches during our winter period, in the middle of our Mini-Soccer and junior football seasons, it means these kids can’t play at all. And surely we have to question the logic behind the current football calendar at this level of the game. It’s not too late to change it. We don’t need to keep it as it is just because it’s always been that way. We cannot ignore the grassroots game. No child is born an England international. Every professional football player there’s ever been has started in the grassroots game. So come on Greg Dyke & co, let’s have a March-October grassroots football season to keep the kids playing. Where Are The Goals Coming From For GTFC?